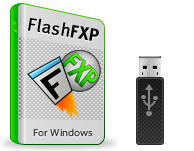 Download FlashFXP USB Portable Edition Now! This installer is designed for use with either USB flash drives or other portable media, but can be installed anywhere. It does not add anything to the add/remove programs, and is configured to run completely from its installed location (does not interact with the registry settings or other FlashFXP installs). It is otherwise identical to the full shareware version. This installer does not require administrative permissions. Publish and maintain your website. Upload and download documents, photos, videos, music and more! Transfer or backup local and remote files. Share your files with your friends and co-workers using the powerful site manager. Once downloaded, run the installer and step through the installation process. Lifetime License. Never pay again for new versions! As a registered customer you get all future versions of FlashFXP free of charge, including major updates. Free technical support. Whatever the problem is, reach the developer directly via the support forum or via an email. Remove the shareware reminder and 30 day trial limit. Access to exclusive development releases via our beta program. If you have any questions, contact us or head over to our User Support Forums. The same license key can be used with our standard and u3 editions. Try FlashFXP for yourself with a free 30 day trial version. You can see how the software looks and explore its features. Download your free trial version today.